Note: This is a special feature post by Carrie Finley-Bajak of CruiseBuzz.net. The Azamara Quest spent two glorious days calling on the Inner and Outer Hebrides. For those that might have to get out the map, it means that we are located in an archipelago off the West coast of mainland Scotland. Part of the appeal of these port calls to Portree on the Isle of Skye, and Stornoway on the Isle of Lewis, is learning about history and culture. The Hebrides were first settled around 6500 BC and reminders from the Celtic and Norse eras are evident in the language, architecture, and music. 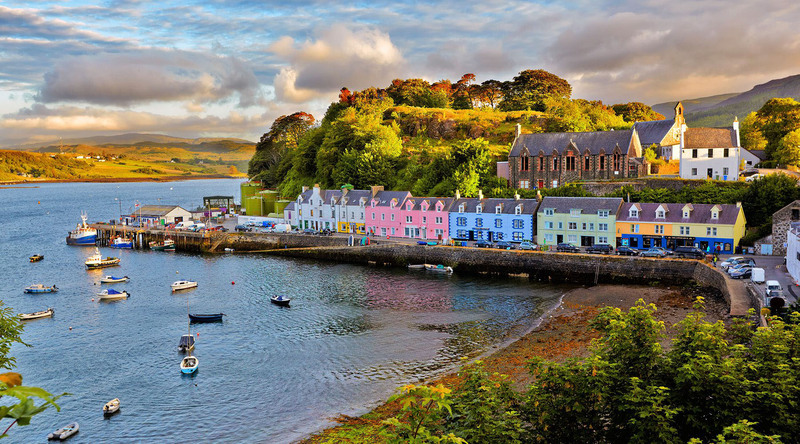 Azamara Quest’s first call was to visit the largest of the 36 inhabited islands that comprise the Inner Hebrides to the harbor town called Portree. Having no idea what I would encounter in Portree, I booked a Azamara Shore Excursions excursion that would take me to Dunvegan Castle and a scenic tour of the interior of the island. In this part of the world, there are no large cities like Dublin or Glasgow, nor is there a local Hop-On/Hop-Off bus to take me around for a self guided discovery tour. So I chose to book a Cruise Global, Connect Local shore excursions tour offered by the ship to ensure that I would not miss important details to help me connect to the region in a deeper way that would not have happened without some assistance from the local tourism authorities. The 3 ½ hour tour was well worth the investment in time. We left the tiny harbor in Portree and headed out to the surrounding countryside. Our guide pointed out the geographical features of the landscape, and provided insight about crofts, and how the people of the region have lived off the land for thousands of years. We also had a rather lengthy discussion on the bus about Bonnie Prince Charlie, and the Clan MacLeod. The sweeping green hills and wild flowers were quite beautiful and the views of Loch Bracadale, Glen Drynock, and Silogachan were absolutely stunning. I also liked seeing cattle, and sheep grazing as we slowly made our way around the island in a circular manner – that means that all the views were different along the route. There were times that I thought I was on a movie set for a new feature about the Scottish Highlands. The highlight of the tour was visiting Dunvegan Castle. The Castle is believed to be the oldest continuously inhabited castle in the Highlands. The castle has been the ancestral home of the Chiefs of Clan MacLeod for 800 years and because it is actually someone’s home, the property would not allow photography inside. Imagine dark wood features, a grand staircase, military relics, oil painting and portraits, beautiful carpets, antiques and an impressive library and you will get the picture. One of the relics from the past and a clan treasure is the Fairy Flag. Our guide told us to be on the lookout for the flag and gave us a brief version of the legend. The Fairy Flag a sacred banner that is said to have miraculous powers and when unfurled in battle, the clan MacLeod will defeat their enemies. Dunvegan Castle is situated on a rocky outcrop on the shores of Loch Dunvegan. A stroll around the gardens and a walk down to the shore is a realistic goal for those who can walk fast. We had close to an hour and twenty minutes at the castle before heading back to Portree. Once back to the main town on the Isle of Skye, guests could walk around to shop or stop by a local pub for some refreshments. The last tender from shore was 9:30 pm so there was plenty of time to explore. On our second day in the Hebrides, I was able to make more connections with the past. The little town of Stornoway might be small but it is definitely mighty. Stornoway is the largest settlement in the Outer Hebrides. This precious little jewel of a town is located on the Isle of Lewis. I took the tender and did a meander around the city on my own. One of the predominant features on the skyline was Lews Castle, which is a Victorian era castle located west of the town of Stornoway. The castle is an easy 15-minute walk from the tender boats, but make sure it is open first before making the hike. The town of Stornoway has a nice cruise terminal building with free and fast Internet connectivity for those interested. Also, there are a few nice tributes around the city paying respects to the herring girls of Stornoway. The herring girls are an important part of Stornoway’s history and remind visitors of how the fishing industry helped many families earn money. Another reminder of the history of the area is through music. Celtic music was streaming from a shop for the Heb Celt’s 20th music festival. As luck would have it, the Azamara Quest arrived at the beginning of the week that would feature music, dancing, crafts, food, and fun at the Hebridian Celtic Festival. The town was certainly in a festive way as they prepared to greet 6000 visitors who are estimated to attend the festival. Azamara Club Cruises promises to take guests to faraway places and in the case of the Hebrides with two days to explore the region, it lived up to the claim. Azamara will return to Portree, Isle of Skye, in 2016 and 2017. Gdansk, Poland: Can One Painting Tell the History of a City?